1. Moleskine City Guides - Set of 3 London, New York and Milan should not be experienced without this set of three (one city each) Moleskine City Guides. A Moleskine City Guide becomes your personalized guide, built over time and used for a lifetime. Each guide includes 228 pages – 44 in color – and up to 36 maps, including areas of interest, metro routes and an alphabetical street index. 2. Nomad Travel Silverware Handy for travel, camping, and "on the go" activities, the nomad is a fork, a knife, a spoon and a bottle opener in one - that folds neatly into a plastic compact cover when not in use. And the 34" nylon strap makes it easy to have the stainless steel utensils around. Available in orange and black. 3. Luggage Tags - Set Of 6 Identify your luggage from afar with these vivid luggage tags. Featuring refreshing colors, fluorescent plastic zip ties, name and address fields and messages like "careful: my shoes are inside," these disposable tags are just the cure for jetlag and frequently confused luggage. 4. Travel Log This beautifully constructed binder articulates the jet-setting glamour and excitement of world travel. With spaces to paste foreign flowers and record how much fun was had on a 1-10 scale, this journal is a far more considerate travel companion than a standard notebook. 5. Lexphone Telephone There's no place like home, but if you can't be with the ones you love at least you can call. And with this phone, it won't cost you a dime. Simply plug it into your computer's USB port and dial anywhere in the world for free! 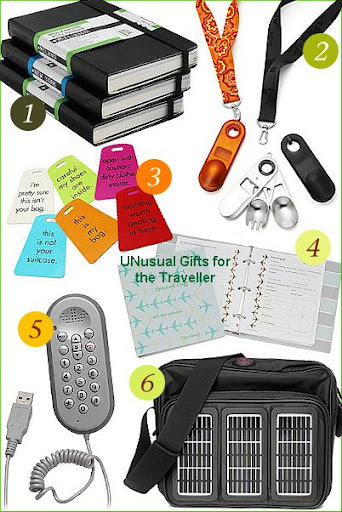 Lightweight and compact, it's great for use with a laptop when you travel. 6. Solar Powered Messenger Bag Whether you're toting an iPod, a cell phone, a PDA or a digital camera, running out of batteries will render your device pretty much worthless until you can find an outlet. With this bag you can recharge without even going near a building. Just walk out in the sun - and the solar panels on the bag will send power straight to your device. Great for travel, hiking or wherever you don't want to run out of batteries.